﻿ In-Flight Injuries on Airplanes: Who Is Responsible? In-Flight Injuries on Airplanes: Who Is Responsible? People are injured every year due to events that happen during their flight. One of the most common causes of injury, for example, is a passenger being hurt by an overhead bin opening and the contents falling out. As airline travelers know, the contents of bins can be heavy luggage. Another frequent cause of injury is caused by food carts. Turbulence also causes injuries every year. Who is responsible for these injuries? The answer can be complex. Airlines are called “common carriers,” which means they have a duty to carry the public. 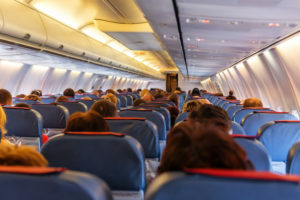 They are regulated by the Federal Aviation Administration (FAA) and the Federal Aviation Act, which requires airlines to have a very high standard of care toward their passengers. They need to ensure that all aspects of air travel under their care is safe, including maintenance, inspection, operation, loading, and boarding of an airplane. In practice, this means that the airline boarding and exit procedures must be safe for passengers. It means that all facilities, from restrooms to coffee cups, should be safe to use. Airline employees should be well-trained and able to fulfill their duties. Given their duty of care, it is possible to conclude that an airline could be responsible for an injury sustained in the middle of a flight. If an attendant does not fasten a bin properly, for example, and it springs open, the airline could be responsible if inadequate training could be proven. However, it is also possible that manufacturers are to blame. If an airline’s toilet malfunctions and causes injury, for example, an investigation may be necessary to determine whether the toilet itself was faulty, or whether inadequate maintenance was to blame. If defects in the airplane itself cause an accident, the manufacturer or the sales agent may be held responsible, unless the defect should have been discovered by routine airline maintenance. If an airplane has been repaired in such a way that didn’t cure defects or introduced defects, the repair company can be responsible. Finally, passengers can sustain injuries due to what insurance companies call “Acts of God.” The term generally applies to an act that couldn’t have been anticipated or planned for. Unexpected turbulence from say, geese running into a plane may fall under the “Act of God” definition, because the pilots could not reasonably have forecast such an event. Turbulence caused by weather may also be an Act of God if it’s unexpected. But most weather is forecast, and the airline can be responsible if they didn’t plan for the forecast and urge people to stay in their seats. Do You Need a Personal Injury Attorney in New York or New Jersey? If you or a loved one has been injured or even killed in an in-flight accident, please contact our law firm to discuss your case. The causes of an in-flight injury can be complex, and an experienced personal injury lawyer can be of invaluable assistance in determining whether you have a case, and against whom. The NY & NJ personal injury lawyers at Kantrowitz, Goldhamer & Graifman have years of experience fighting for the rights of victims of negligence. Call us at (800) 711-5258 or fill out the form on our website. We will be happy to meet you at our Rockland County, NY or Bergen County, NJ offices. The personal injury consultation is free, and there is never any obligation. U.S. Department of Transportation. Federal Aviation Administration. A Brief History of the FAA. https://www.faa.gov/about/history/brief_history/. U.S. Department of Transportation. Federal Aviation Administration. Safety: The Foundation of Everything We Do. https://www.faa.gov/about/safety_efficiency/. Can Alimony Payments Be Terminated When You Retire?